(2011 A Thousand Words Contest) (2011 May/June Fic Trade) Cinder discovers a treasure in his grandfather's keepsakes box. A whisper of sound woke him. His nerves fine tuned to alerts after nearly a moon of long-patrol, Farscout came awake at once. He blinked his eyes clear, disoriented for a heartbeat to find himself sheltering under a ceiling of interwoven roots and a quilt-work of moonmoss. Again � there it was, a slight rasp of leather against stone steps; Farscout sat up from his sleeping furs beside his lifemate�s bier and turned toward that sound, identifying his visitor by scent even as a voice whispered from the Gathering Den stairs. Redfox came the rest of the way down the stairs and into the Sleepers� Den. Ten winters old now, the boy was thin and wore his crimson hair away from his fine-boned face in three bright braids. Farscout patted the sleeping furs beside him and the child settled there, kneeling with something cupped protectively in his hands. �You�ve been working on it some more?� Farscout asked. He rubbed his eyes and swallowed back a yawn, very careful to hide his weariness. The chief�s youngest son was prickly in his pride, and would retreat again if he felt his elder perceived him to be intruding. The moonmoss bathed Redfox�s face in faint blue light, and made the boy�s cerulean eyes seem to glow. The boy was almost vibrating with contained energy as he opened his hands, exposing the treasure he was holding. �Every day. I�ve climbed up to Cider�s den for the best light and worked on it,� the boy said, grinning one of his rare, shy grins. Farscout reached down and gently stroked the boy�s handiwork. 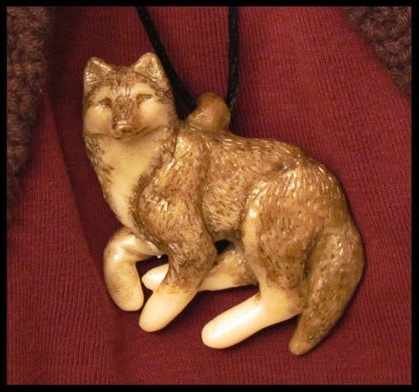 When Farscout had last seen Redfox�s work, he had carved a boiled branchhorn knee-bone down into a egg-shaped oval. In the past month, that oval had been further crafted into the shape of a prancing wolf. The speed of the child�s efforts was a surprise, but even more so was the sheer skill. Cinder had gone silent. Instantly on alert, Blacksnake looked up from the arrowhead he was carving from a piece of antler. Sudden silences from his grandson weren�t quite as alarming as they were from Crackle or Rill, but Blacksnake still knew a warning sign when he heard it. Across from him, on the other side of the Hunt Leader�s den, Blacksnake saw Cinder sitting with his back turned, shoulders round as the boy hunched his body over whatever-it-was he cupped in his hands. �What have you got there, cub?� Blacksnake asked. Farscout sought the boy out as soon as he had finished his patrol debriefing with the chieftess. His return from long patrol missed the New Green celebration by a handful of days. Farscout had not wished to participate in the New Green festivities since his lifemate had gone into wrapstuff, but this spring he did regret not having made it home in time. Farscout rocked back on his heels, startled by the boy�s vehemence. He touched the boy with a questioning send, urging him the share; the boy�s mindtouch rebuffed him, prickly as a quill pig on the outside and roiling underneath with emotion. Farscout frowned. The child�s heartache seeped through Redfox�s detached fa�ade. Farscout wanted to hug the boy and comfort him, but the chief�s cub�s bruised pride did not seem to welcome that. **Talk to your sire,** Farscout sent gently, refusing to be rebuffed. Cinder smiled � it was a knowing smile, sympathetic and tender and, for a moment, entirely so much his grandmother Easysinger�s expression that Blacksnake felt his heart seize in his chest. Cinder patted his grandfather�s leg and offered him the soft suede pouch which the boy had found the amulet stored in. Cinder grinned and sprang to his feet. �Yes! I�ll make one of my own, and it�ll look just like Longhowl, too!� With that, the boy was gone, dashing off in search of his father. Blacksnake put the amulet-pouch back into the wooden keepsake box on its shelf. He closed the box�s lid, lingering for perhaps a moment too sentimentally in that task. Then he returned to his seat on the fur-covered bed, and picked up his arrow-head carving tools again and settled back to his unsentimental work at hand.